Gausman & Moore is a Minnesota-based mechanical and electrical engineering firm with offices in St. Paul and Duluth. With additional specialties in pluming, industrial, and low voltage design, Gausman & Moore delivers its consulting engineering services to institutions, corporations, and governments throughout the United States. But they don’t do it alone. Last summer, Gausman & Moore was on the lookout for a new electrical engineering intern. Utilizing the SciTechsperience Internship Program to help them find qualified candidates, the leadership team started searching for someone who could work with and learn from their senior electrical engineers. Sina Kassaw is an electrical engineering major at the University of Minnesota. She came across the SciTechsperience program by accident when, after dropping her brother off at a career fair, noticed the SciTech table and decided to learn more. Not long after enrolling, Kassaw was applying for internships and soon secured her place as an electrical engineering intern with Gausman and Moore. 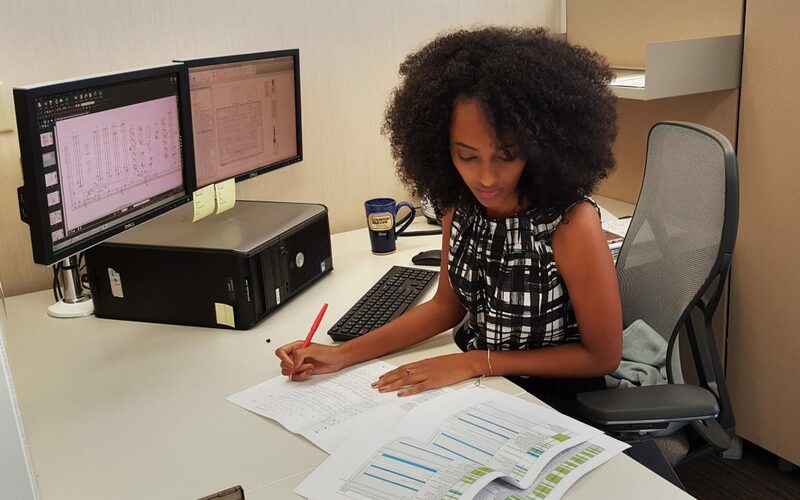 During her time as an electrical engineering intern, Kassaw further developed her abilities through a series of real-world projects and assignments. This included a combination of computer aided modeling, document production, technical research, design and redesign work.